Blaring from shrill speakers is music from sungura musician Taruvinga “Shuga Shuga” Majokoto. The loud music is coming from a grading shed at a farm in Mvurwi. The music is quite popular on Zimbabwean farms.But at Stockwell Farm in Mvurwi, Mashonaland Central, the music is not coming from a farm bar, unlike many areas where tobacco barns have been turned into bars at farms in Zimbabwe. It is the peak of tobacco harvesting and grading in preparation for the market. Workers at Mrs Agnes Kanhanga’s farm play the music to keep their spirits high. The mood is synonymous with the great work that is associated with good business acumen Mrs Kanhanga has adopted at the farm. Her secret: a contract she penned with Tian Ze Tobacco Company (PVT) Ltd.
She is expecting to be rewarded for her astute business decision that has seen her tobacco growing project growing over the years. “Farming is a business and one has to be very careful in making decisions that are profitable so contract farming is the solution for Zimbabwean farmers. Mrs Kanhanga started farming in 2004 concentrating on maize until she shifted to tobacco two years later. “The previous farmer was a tobacco farmer and most of the workers had, over the years, gained experience in tobacco farming. “We started by taking the crop to the auction floors until we realised that we had to up the scale and go into contract farming,” she said. Mrs Kanhanga started contract farming for Tian Ze Tobacco during the 2007-2008 season. “We delivered close to 70 tonnes of tobacco that season but we have since upped our production levels to 200 tonnes per season,” she said. She receives inputs and technical advice from field managers provided by the company throughout the season. “Part of the loan also goes to pay salaries and wages for the workers who include 22 permanent and 45 contract workers,” she said. 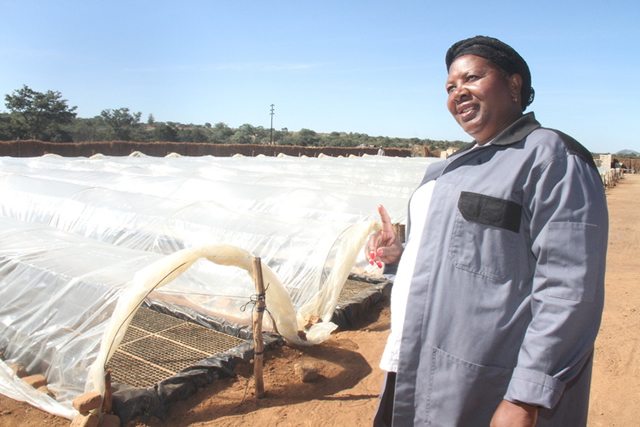 Mrs Kanhanga, who is already preparing for the forthcoming season, believes contract farming should help Zimbabwe develop the agricultural activities to the levels enjoyed before the land reform programme. “It is critical to save so that one day the farmer could wean themselves off the contractor at sometime. “Contract farming helps the farmer and the contractor but more importantly for the former who benefits from capital equipment and technical advice,” she said. Tobacco farmer Mr Denford Mutwiwa shares an equally successful story after going into contract farming in 2012. The farmer at Teryden Farm, Headlands in Manicaland has since invested into a $800 000 tunnel tobacco curing system, 12 tractors, eight centre pivots and a truck from his activities. “There are increasingly loud calls for farmers to take agriculture as a business and as an emerging crop of farmers we can only achieve our goals through contract farming,” he said. Mr Mutwiwa concurs with Mrs Kanhanga that farmers can only succeed through contract farming. “Tobacco is a 12 months crop and we rely on the funding to keep going as a business. If we are fully capitalised there is a chance that we could wean ourselves from contract farming. He said the contractor, being wary of possible losses, is hands on during the season. “Agronomists visit regularly and are always trying to help at every stage of the season to the extent of making sure that the farm workers are being paid on time,” he said. Mr Mutwiwa went into farming during the agricultural revolution that saw over 300 000 families benefit from Government’s land reform programme. “I was initially allocated 40 hectares in 2001 and I think I did quite well that the authorities thought I deserved more so I was moved to the 300-hectare farm in 2004. “That same year I started tobacco farming on a 15 ha plot, increasing the hectarage to 25ha and eventually 40 ha. He was contracted by Tian Ze in 2012. “The move saw things moving at a brisk pace and I built the tobacco curing tunnel that year and I have since bought some tractors every season I was contracted to them,” he said. He has been equipping the farm since he went into contract farming. “I do not even need to borrow anything because since 2012, Tian Ze has helped me build the tunnel, bought five centre pivots, six tractors and a truck,” he said. Mr Mutwiwa has eight centre pivots with the latest being installed on a 50 ha plot cleared in preparation for the next season. He has been receiving up to $600 000 per season from the contractor. “I am currently accessing over $1 million because my hectarage has since increased to 190 ha for the forthcoming season,” he said. Mr Mutwiwa hailed the Tian Ze contract farming programme. “The good thing is that they do not charge interest on the inputs and on capital equipment. We get interest free loans, that is, no interest is charged when a farmer pays back the loan in 12 months,” he said. Delivering 400 bales of tobacco every week, Mr Mutwiwa looks at putting 600 tonnes on the market from the previous season. Proactive knowledge management specialist and agricultural expert Mr Charles Dhewa identified some advantages of contract farming as easy access to inputs by farmers and assured access to commodities by contract companies. He said farmers were also guaranteed markets for their produce while accessing cutting-edge production knowledge from contract companies. There are also opportunities for farmers to transfer good agricultural practices to other commodities outside contract arrangements. Mr Dhewa said contract farming also supports agro-processing and manufacturing. The Tian Ze Tobacco contract farming project started with one farmer on twenty hectares but is now is involved in the entire tobacco supply chain from contract growing, auction floor purchasing, processing and exporting of tobacco to China. Tian Ze became operational in 2005 with the main purpose to facilitate and strengthen collaboration between Zimbabwe and China in the revival of Zimbabwe’s tobacco industry. Tian Ze offers premium prices directly to growers helping push the grower prices on the auction floors. According to the Tobacco Industry and Marketing Board statistics, Tian Ze’s 2014 average price for auction floor purchases was 55,3 percent higher than the national average price for tobacco from the auction floors. The average price for contract purchases, according to the TIMB, was 13,3 percent higher than the average for the rest of tobacco contractors combined. Contracted farmers are on a monthly basis required to review and sign statements indicating details of their loans (their inputs requests and invoices and delivery notes with inputs quantities and prices), loan repayments from their tobacco sales and the balances. Farmers who fail to settle debts, according to Tian Ze, are requested to provide their settlement plans for outstanding debt. Tian Ze gives inputs at no interest and does not ask for collateral to cover the entire loan amount. There are currently 387 contracted farmers amid commitment for continued support for the Zimbabwean tobacco industry. 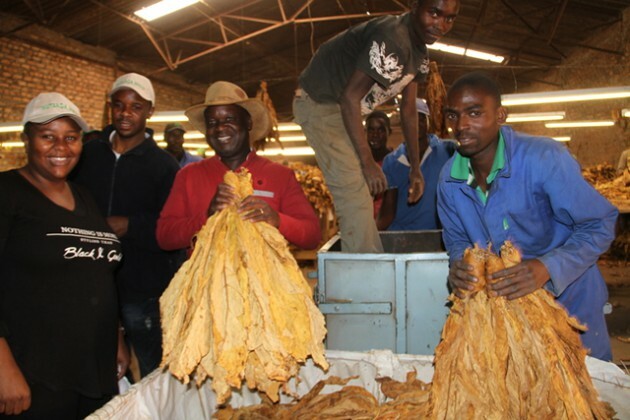 Zimbabwe has so far realised over $600 million from tobacco auction floors this season.